سواءً كنت مسافراً بغرض السياحة أو العمل، Cape Tribulation Beach House هو خيار عظيم للإقامة خلال زيارتك للمدينة. يسهل الوصول إلى هذا الفندق ذو 3.5 نجوم من المطار، فهو يبعد عنه مسافة 140 km فقط. يشكل هذا الفندق ملاذاَ مريحاً للاسترخاء ويمنح زواره فرصة للاستجمام والتجدد، وهو يقع على بعد خطوات من المعالم السياحية الكثيرة للمدينة. إن Cape Tribulation Beach House حريص على توفير الراحة للنزلاء، فلا يوفر الموظفون جهداً في تقديم أفضل الخدمات وضمان حسن الاستقبال. هذه بعض الخدمات الموجودة في هذا الفندق: خدمة التنظيف يوميًا, مجهز لذوي الإحتياجات الخاصة, مرافق مخصصة لذوي الاحتياجات الخاصة, تسجيل وصول/خروج سريع, تخزين الأمتعة. استمتع بوسائل الراحة الراقية في الغرف أثناء إقامتك هنا. بعض الغرف تتضمن بياضات, اتصال لاسلكي بالإنترنت, غرف لغير المدخنين, مكيف هواء, تدفئة لمساعدتك على استعادة طاقتك بعد يوم طويل. صممت خدمات الاستجمام في الفندق والتي تتضمن كنو, مسارات المشي, شاطئ خاص, حمام سباحة خارجي, صيد السمك لمساعدتك على الاسترخاء والراحة. إن Cape Tribulation Beach House هو مكان مثالي للمسافرين الذين يتطلعون إلى الراحة والاستجمام في المدينة. Amazing experience and certainly worth 2 or 3 days to see everything. We had a great time in this nature resort. Our cabin was right on the beach. The staff were very friendly and helpful. A little bit pricey but generally an amazing experience where the rainforrest meets the sea. Wonderful location offering accommodation for true backpackers plus slightly more luxurious accommodation for those reliving their backpacking youth. Location is fabulous. Rooms are a bit run down and pricey. But location makes up for it! 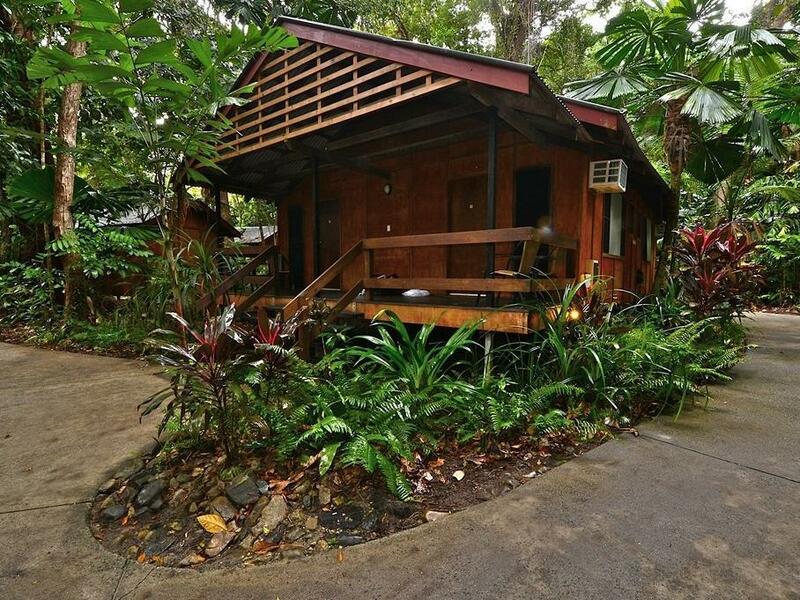 Pros - cabin on the beach in a rainforest setting. Fanstqstic restaurant quality food, large servings and good prices. No mozzies, great atmosphere, very quiet. Excellent staff service. Very friendly. Pool is fantastic. Cons- a pool table would have been nice. Pool is very steep to get into no railings or steps out Overall cons are limited throroughly enjoyed our stay we even extended by a night. One of the only choices of accommodation that is located right next to the beach in this area. Cabins are pretty basic inside but were very clean. We were a pair of friends sharing a Ribbon Cabin which was down near the restaurant & beach. The cheaper options are further up the hill but still not far. There were a lot of backpackers staying and a lot of tour groups that come through to use the restaurant in the daytime but is was still a nice vibe even for the more independent holiday makers. To get the most out of staying in the area you definitely need your own car. We had 3 days and felt that was plenty of time to see and do the activities in the Cape Trib region. You have to cart your bags to your lodges which are not overly close to your car. If you love nature this is a great place. No wifi unless you pay quite a lot and sit in one spot at the restaurant and no tv in the room. Water pressure very poor and bathroom had red ants and cockroaches! Staff very friendly. beautiful jungle area also can see the beach back of the restaurant. no tv and wifi in your room but can enjoy listening the jungle sounds. Fabulous setting allowing the rainforest/jungle experience to continue. Excellent dinner, comfortable sleep. Understand the demographic you're mostly catering to but the very loud music at the bar and pool vin the afternoon really kills the atmosphere/locale. Ok to have music but subtle during the day would be my way to go. Cabins are very basic. Don't expect TV or internet, but great if you want to hear the bird and animal noises at night and in the mornings. The restaurant is very convenient and a good spot for dinner. Whilst the Site has a young vibe we, as a retired couple were welcomed and made to feel at home. The location of our St Crispen cabin was superb with a 50 metre walk through forest canopy to a superb pristine beach. The English bar staff are professional, friendly and respectful. The accommodation was well designed, functionally and aesthetically. Generally a memorable experience in an extraordinary location. Well done. We were upgraded to a cabin facing the beach and probably as isolated in the rainforest as it could be. 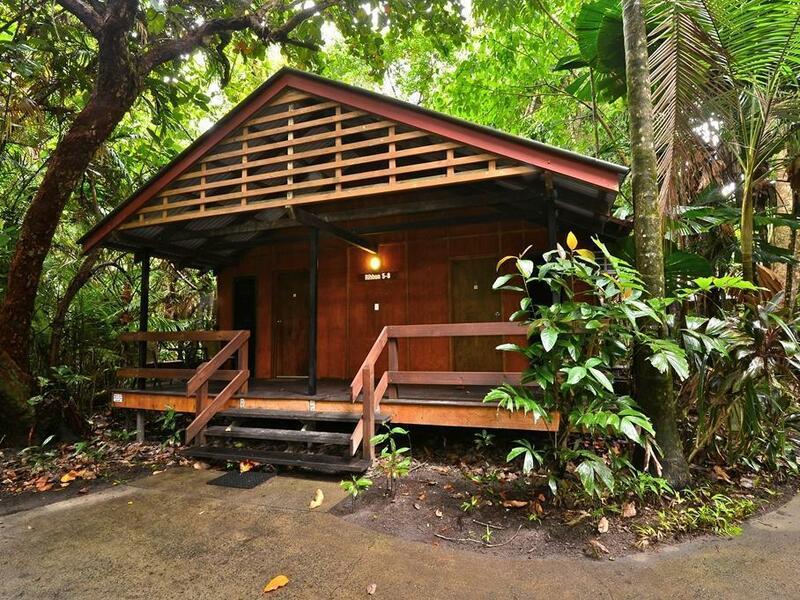 The cabins are simple but very clean, comfortable and provide the most amazing experience of sleeping where the jungle meets the sea without the hazards of bugs or being overexposed to the elements. I would stay here over a fancy resort anytime, it's a truely beautiful spot. The hut was handy to the beach and restaurant, clean and comfy. Staff friendly and helpful. Restaurant was good and menu to suit most people. On arrival we were given comprehensive advice and warned about a croc that had been seen in the area. Glad to be given that info. This has to be one of the most beautiful locations for holiday accommodation in the world - Cape Tribulation is just stunning. 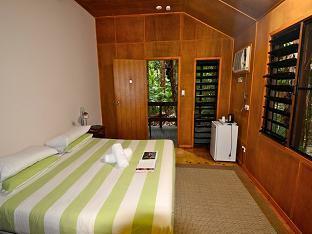 The accommodation is basic but perfectly adequate considering you are in the rain forest! The quality of the food exceeded our expectation and was equally as good as the fare served at our last hotel - a 4star place in Cairns. The staff were friendly and efficient! We had a problem with our bungalow on the last night but Mat the Manager sorted things out in double quick time. Overall this was a fantastic stay! Location is incredible, decent rooms, good self-catering options. Very nice indeed. Unbeatable locale, good room rates and having the option of being able to self cater is a very attractive option to a family of five on a budget. Service was a little cool to start with but that may have been due to business being brisk the first day. It got much friendlier the second and third day. Booked activities through them, went off without a hitch. Great housekeeping, they have a lot to deal with between the beach and rainforest and keep everything clean. Have already recommended to friends.